Born in 1911 in Hai Men, Jiangsu Province, Mr. Yu-Ziang Hsu grew up in the area south of Yangtze River where cotton was one of the major crops, thus cultivated a special interest in his devoted lifetime career of the textile industry. He worked while still young in a cotton trade shop as his first job. In 1937, he founded with friends in Shanghai Tong Mao Hua Trading Company. 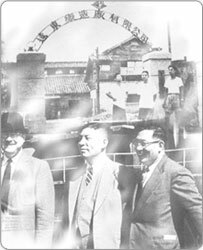 During the winning of the Sino-Japanese War in 1945, he established Da Tong Cotton Co. and initiated his own manufacturing business. Later on, he opened Far Eastern Knitting to enter into the textile industry. In 1949, Mr. Y.Z. Hsu, approaching 40, moved his business with the Government to Taiwan and founded Far Eastern Textile Ltd. in Panchiao, Taipei County. In 1957, Taiwan's economy boosted with the Government's promotion of the national economic and reconstruction plans. Mr. Hsu saw the future trend and established with close friends the Asia Cement Corp. to manufacture the much needed cement material. Through fierce competitions and numerous tasks, Mr. Hsu gradually expanded his scopes of businesses from textile and synthetic fibers to include petrochemicals, cement, retail, financial services, transportation, telecommunications, and etc. With total assets of over US$16 billion registered in 2000, the Far Eastern Group is Taiwan's most diversified industrial conglomerate. As a good corporate citizen, Founder Hsu received on April 29, 1999 the Order of Brilliant Star with Grand Cordon from then President Lee Teng-Hui for Mr. Hsu's lifetime contributions and dedications to the industrial and economic developments as well as other social causes. On December 23, 2000, Mr. Hsu, the remarkable industrialist and entrepreneur who had lived a full life, passed away at the age of 90 leaving a valuable heritage of "Sincerity, Diligence, Thrift and Prudence".